I found this old award badge at an antique mall last month, and have puzzled over it since. It's one of the oddest items I've ever found. Made of die-cut leather, it measures about 5 inches in diameter. There's a small damaged area at the top where I think a ribbon and pin may have originally been attached so that it could be worn. 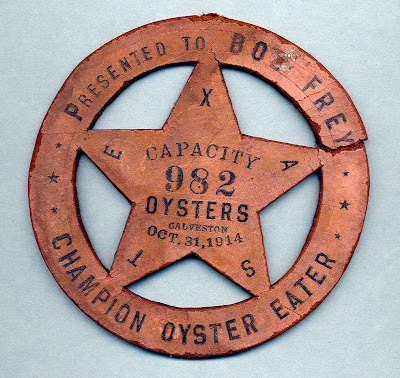 The text reads: "Presented to Bob Frey Champion Oyster Eater Capacity 982 Oysters Galveston Texas Oct. 31, 1914". Near as I could tell (thanks to some rather lazy googling) the current world oyster eating record is "only" about 420...so old Bob must really have been something special.